Encourage awareness of mental health during and around Mental Health Week. Promote open discussion relating to mental well-being. Reduce stigma surrounding mental illness. Inspire Winnipeg citizens to take care of their mental health. 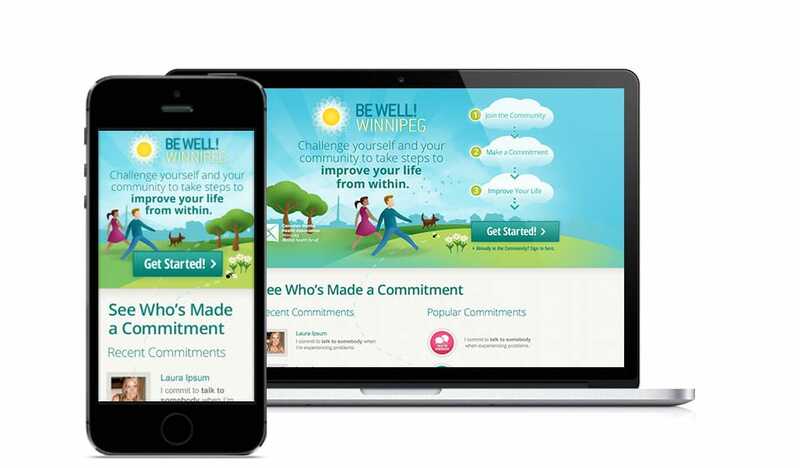 Be Well Winnipeg is a community-centric mobile app and website that brings sponsors and community together to plan for better mental health for all. The tool teaches people to make small changes every day to improve overall mental health and to celebrate and share their successes, building both personal and community resiliency. 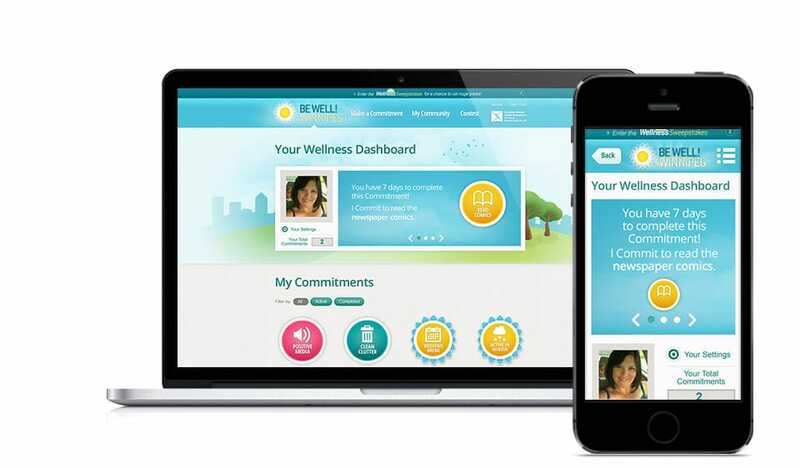 The app breaks down wellness into small and easy commitments that can be shared through social media to create networks of support. The Be Well model is built on the person at the centre surrounded by a community of support through social media and networking aspects. The model considers all aspects of the person’s life and wellness as related to social determinants and wellness indicators. Facebook users were allowed to log on with single sign-on authentication, and they were allowed to cross-promote their site activity via “share” and “post” features. A live Twitter feed managed by the program coordinator offered milestone achievements and related events promotion. 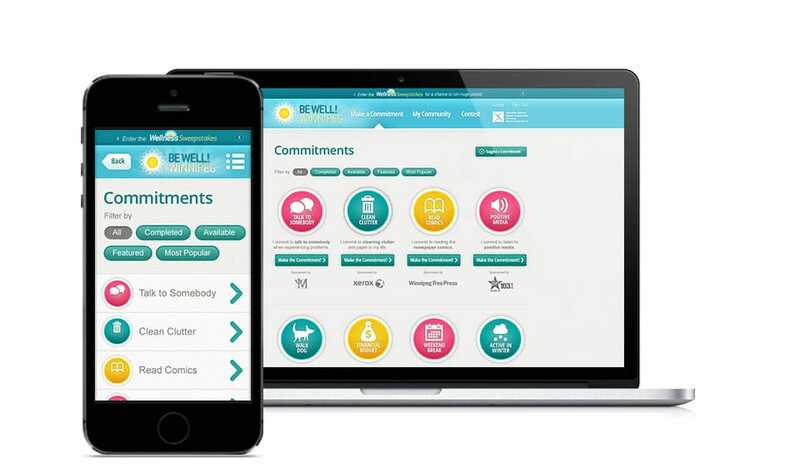 Be Well Winnipeg increases user understanding of mental health and educates users about the small changes they can make every day to improve their lives. The app had high user engagement for a regional campaign with thousands of users making commitments, posting regular updates, and returning to indicate that they had met their commitment. Over 90% of users opted-in to receive automated email notifications from the app. The client believes this engagement is evidence that the tool was effective in helping people learn about and plan around their mental health and wellness. Qualitative comments were also extremely positive, both from users and from sponsors of the campaign. The program provided a unique sponsorship integration platform for community and business partners via “sponsored” commitments matched to each organization’s unique objectives. As a result, sponsors were active participants — many promoted the resource in their own workplaces as part of workplace wellness, allowing CMHA to reach out to new audiences. Various levels of partnership allowed large-scale corporations (CN, Virgin Radio, Winnipeg Free Press), small businesses, and partners in mental health alike to participate. The Canadian Mental Health Association (CMHA) promotes the mental health of all and supports the resilience and recovery of people experiencing mental illness. The CMHA accomplishes this mission through advocacy, education, research and service. CMHA branches across Canada provide a wide range of innovative services and supports to people who are experiencing mental illness and their families so they can develop the personal tools to lead meaningful and productive lives.